The beauty industry is always changing. There is a constant influx of new modalities and ingredient technologies being launched in the spa market, as well as in the mass market. Knowing what your clients are doing and using is critical to bringing them skin care success and avoiding adverse reactions. The good news is skin care professonals already have the perfect tool to obtain this information from the client—the intake form. The intake form should be utilized on every visit. Have the client fill out the full form before their first visit, with a shorter form available for subsequent visits that is updated with any changes in medications, health, home care, wellness services and skin care treatments. By keeping these updates on file, you are protected if an issue was to arise with the treatment you are performing. This article reviews the critical information you need to include on your intake—both basic and medical—to ensure that you are getting all the information you need to perform successful treatments with no unwanted side effects. Consider having clients complete their intake form prior to their visit, just like in a physician’s office. Otherwise, have clients arrive 15 minutes early to get this done prior to the first treatment. This will give you enough time to analyze what is going on with their past and current skin care routine to determine which questions you may want to take a few minutes to review once you get in the treatment room. The basic information you need to have on your intake form includes: personal information, skin typing, home care products and devices and lifestyle, as explained below. Personal Info. In this section, include: name, address, phone, email, birth date, phone, emergency contact and referral information. Skin Typing. This could include Lance and Fitzpatrick scale, general tones, observations of skin and even asking questions about sun exposure and sensitivity. Home care products. 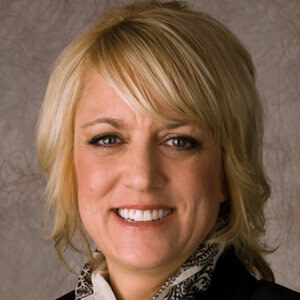 It is more important than ever for the skin care professional to be retailing to clients. If not, clients will most likely go elsewhere to purchase, which could counteract the desired results. Many clients purchase expired and even more aggressive products (peels) with skin-damaging results. For example, if someone is using a retinol product or glycolic product at home (while the percentage may be low), it is affecting their skin. Knowing this may help prevent a reaction in the treatment room. Personal devices. Many clients are able to purchase units for home microdermabrasion, hair removal, LED, microcurrent and even needling. The skin care professional should be aware of these, as they may produce unwanted side effects or cause an undesired outcome in the treatment room. Lifestyle. Lifestyle questions should be added to the intake form. Climate, profession, stress levels, diet, sleep patterns and even hobbies should be discussed. Answers to lifestyle questions will also help address why a client’s skin is flaring with eczema, psoriasis, acne, etc., as these stress, diet and environment changes can trigger a variety of issues.1 Clients living in elevated, humid or dry conditions will see an effect on their skin. Knowing that a client works over a stove or has to wear a face mask in the operating room all day will help determine facial and home-care treatments. For example, avid skiers or hikers will be exposed more to sun and should probably avoid peels or aggressive treatment choices. Dietary issues should also be included, and that client should be encouraged to seek the help of medical professional if they are experiencing issues. Spa treatment history. Getting a history from a client on previous skin treatments and results will help with a treatment plan. Include a spa treatment history question on their updated intake form with every visit so the practitioner is aware of any recent treatments. This would also include any type of recent hair removal treatments. A separate part of the intake form should ask questions that obtain medical information such as: physician care, medications, medical conditions, disabilities, previous conditions, hormonal issues and allergies. Physician/dermatologist. Is the client currently under some type of physician’s care? If so, what are they being treated for? This could be any type of doctor, not just general practitioner. Medications. Many people are on some type of medication ranging from antibiotics, antidepressants, birth control to more serious medications for cardiac or diabetic issues. Most prescriptions have contraindications, with photosensitivity being a prevalent one. While they may not currently be on medications, always ask if they have taken any medication in the last 30 days. Drugs like steroids may carry longer contraindications for desired facial treatments. In addition, consider topical and herbal supplements the client may be using, as they can also have contraindications. It is recommended to have access to the The Physician’s Desk Reference (PDR) Pocket Guide to Prescription Drugs. Medical conditions. 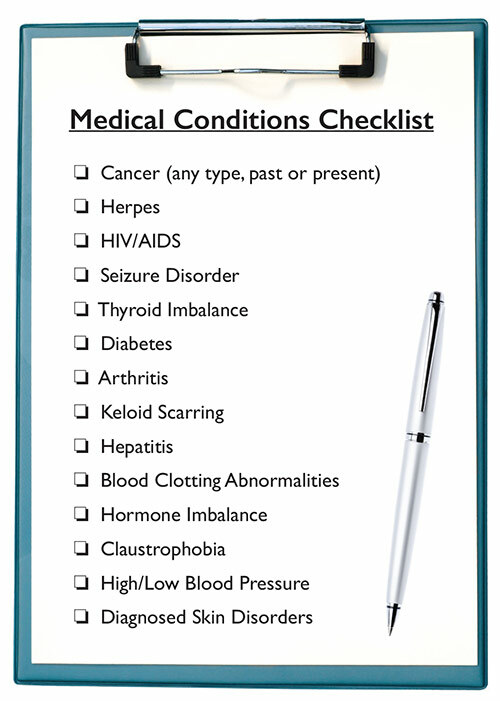 Utilize the Medical Conditions Checklist, and have clients elaborate on yes answers. Knowing medical conditions will help you develop a treatment plan and be aware of potential issues that could arise. For example, knowing a client has diabetes can help the pratitioner avoid sensitive injection sites and be ready for an episode of hypoglycemia. In another example, skin care professionals want to avoid doing treatments that open skin, such as microblading, on someone with clotting issues. Being aware of any physical disabilities or even sight or hearing issues will help you schedule more time for treatment to make them more comfortable. Medical equipment. Does the client have a pacemaker, medical port or even a urostomy bag? Being aware of these items will allow you to make room and bed accommodations as well as avoid certain treatments that might be contraindicated. Hormonal issues. Ask about the client’s last menstrual cycle, as there may be contraindications with unexpected results depending on the timing of more aggressive treatments like lasers or peels. Hormonal concerns can also include endometriosis or a PCOS diagnosis, which have negative side effects such as photosensitivity, pigmentation, excessive hair growth, etc. These side effects may have contraindications with determining a treatment plan. The knowledge of hormonal medications, including creams, internals or even birth control, will also be helpful. Allergies. Allergies can include a variety of things including fragrance, foods, cosmetics, household chemicals and environmental (mold, pollen) substances. Clients can also be allergic to fibers or latex that may be used in the treatment room, so always ask. Many people have fragrance allergies, and it is wise to ask if the client has reacted to a fragrance or just has a dislike for a specific fragrance. If needed, a different product choice, mood candle and even the skin care professionals’ personal choice of fragranced items will need to be considered. Many manufacturers are using food-grade ingredients in their products for desired treatments of conditions as well as for color. Numbers of soy allergies and celiac disease have increased, and knowing these allergies will allow the skin care professional to choose the right products. Allergies to pollens, mold or even animals are great to know for avoiding issues in treatment the room.